Sharp has developed a 3D camera module for mobile devices capable of capturing HD (1260*720) 3D video images, an industry first. This means, in near future you'll be able to shoot 3D videos on your cellphone and watch it on 3D television, or watch it on the phone if it's also equipped with 3D display like Hitachi's WOOO Ketai H001, which seems very likely if it's featuring 3D camera. You might even be able to shooot 3D videos and send it to friends like you do with pictures today, or post it on YouTube directly from a smartphone. From movies to video games, everything seems to be going 3D these days, and consumer devices are accommodating that trend. 3D televisions like Panasonic's 3D VIERA have already hit the consumer market, so you can enjoy 3D films like Avatar at home when the 3D Blu-rays come out. But the 3D camcorders are still strictly-professional business. Panasonic's Full HD 3D camcorder promised this autumn is priced at $21,000, which is not exactly affordable for your everyday home movie makers, and the affordable ones like DXG 3DView Camcorder(due June) seem to be sacrificing image quality and viewing options. 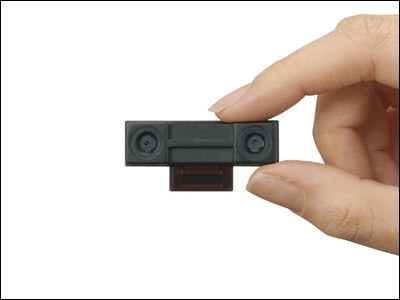 According to the press release, Sharp's new 3D camera module is capable of capturing high-definition (1260*720) 3D video images, and it has functions to process the image data output by the left and right cameras such as adjusting colour and brightness, synchronizing the timing of the video signals, and correcting the positioning. This sounds like much better image quality than DXG 3DView Camcorder. With their high-density mounting technology nurtured over long years of experience, Sharp managed to make it compact enough to be embedded in mobile devices like digital cameras, cellphones and smartphones. The price is as yet unannounced, but considering the competition in the growing market, we'd expect a smartphone equipped with 3D camera to be not far too pricier than its rivals. Sharp will start shipping samples in July, and mass production of these modules will begin within 2010. Previous >>How much will a linear-motored bullet train fare be?